In one of my posts, a few days ago, I told you all about the new Customizable Trove from Vanity Trove (You may check the post here). Well, I got my Personalized trove on Monday (they tried to deliver earlier but we were out for the weekend and I was not there to collect it) and let me show you how it was and what was there inside (of course, it was not a surprise as I only selected all the products, but to get to try things you really wanted to... is wonderful!). The trove came in a beige and gold packing than their usual white and pink. These were the products that I selected from their list which was given based on my beauty profile. I selected seven products and one was given as a bonus from the Team. 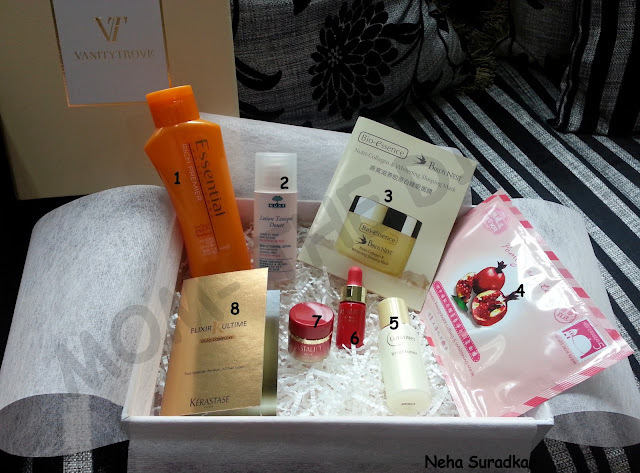 Thank you Vanity Trove!!! 1. Kao KAO Essential Rich Premier Shampoo, 80ml (Retail Price- S$4.50 for 200ml)- This was the bonus product that I received. It is a moisturizing shampoo for unmanageable hair that reduces breakage. You may find the complete product description and reviews here. Value of sample- S$1.80. 2. NUXE Gentle Tonic Lotion, 35ml (Retail Price- S$38 for 200ml)- This a skin toner with mild fragrance of Rose. I wanted to try this because I am in a constant look out for toners. Although I am loyal user of Rose water with Camphor as a toner but sometimes when I recommend products for my clients, some of them do not prefer rose-water and hence I try out toners from different brands. This toner leaves your skin refreshed. Value of Sample- S$6.65. 3. Bio-essence Bird's Nest Nutri-Collagen & Whitening Sleeping Mask, 3g (Retail Price- S$29.80 for 60g)- This is a whitening mask, which will work while you sleep and make your skin healthy, smooth and radiant, restores skin vitality. It is a non-greasy formula and there is no need to rinse off. Any mask that can be used at night while sleeping is great as in if something works for you while sleeping, what could be better than that! Value of Sample- S$1.50. 4. Love More Facial Masks- Mediterranean Pomegranate, 1 pc of 25ml (Retail Price- S$8.90 for 5 pcs)- Love More masks are available in different variants. Mediterranean Pomegranate is for skin brightening. With all the sun and humidity of Singapore that takes a toll on your skin. Value of Sample- S$1.78. 5. Lunamer Brightener, 20ml (Retail Price- S$60 for 100ml)- A skin-purifying and energising beauty essence that wipes away dullness-causing aged keratin and dirt, and recharges skin by delivering moisturising ingredients deep into the corneal layer. It is recommended for use in night after cleansing your face. When I tried this product, it did result in an instantaneous glowing skin. Already loving it. Value of Sample- S$12. 6. Astalift Essence Destiny, 5ml (Retail Price- S$132 for 30ml)- Astalift Essence contains a higher concentration of Astaxanthin, the wholesome goodness of Royal Jelly, skin-firming Elastin and three different types of moisturising Collagens. It has a gel like texture and leaves your skin really soft and supple on use. Value of Sample- S$22. 7. Astalift Jelly Aquarysta, 5g (Retail Price- S$148 for 40g)- Packed with the nourishing goodness of Ceramide, Jelly Aquarysta contains the world’s smallest ‘human-type’ Nano-Ceramide molecules to maximise absorption into skin to replenish lost Ceramide (due to ageing), enhance skin’s moisture retention ability and maintain optimum levels of moisture in skin. The unique light-as-water jelly texture enables a highly-concentrated and stable blend of skin-loving nutrients to penetrate deeply into skin for optimum nourishment. Value of Sample- S$18.50. So, this was all about my personalized Vanity Trove. All products look promising and would love to see what really works for my skin after trying out for a few days. 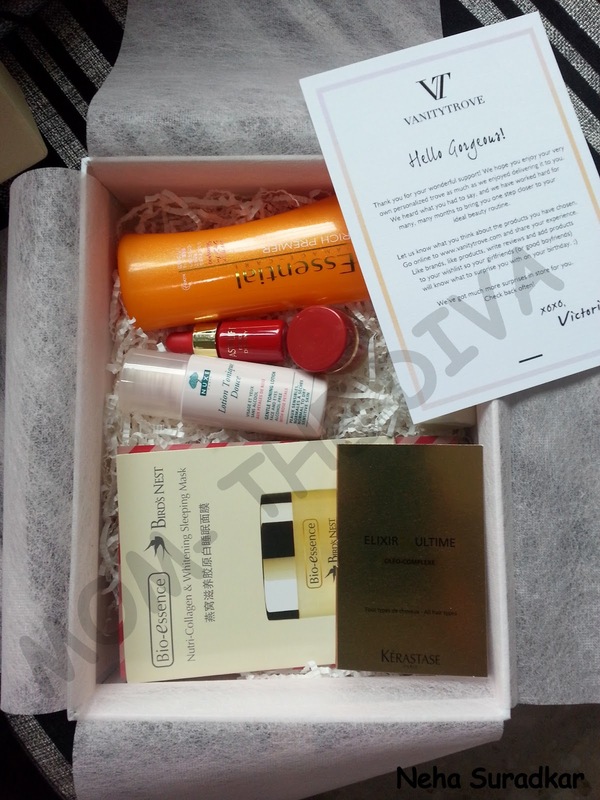 If you would like to receive your Vanity Trove, go for a Vanity Trove subscription at Vanity Trove for just S$25 a month. You may also like register with Vanity Trove, fill your beauty profile, and interact with others and see what they love and are using. The platform is like a facebook for beauty. You may also like to follow me here to know about my favorite products, my wishlist and also product reviews... See you there!